Cozy up in the ADPi house with this sweet Alpha Delta Pi afghan throw blanket. 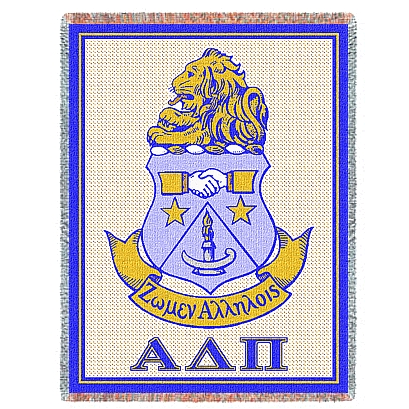 Designed with an oversized Alpha Delta Pi crest in azure and white and topped with a bold depiction of Alphie above, this blanket makes a great lounge accouterment or wall hanging in the sorority house. Our sorority throw blankets measure 48 inches wide by 68 inches tall and are made from high-quality, woven fabric.